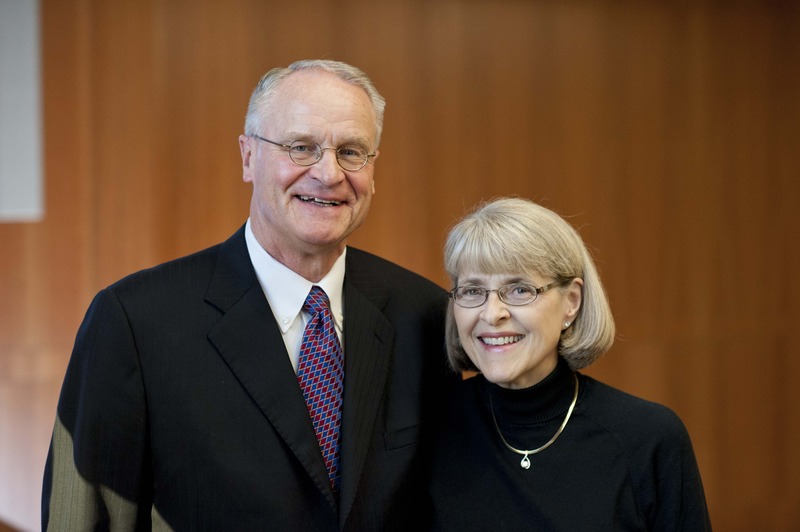 When it comes to charitable giving, Pam ’72 and Paul Olson have utilized almost every method available to them—and, over the course of four decades, their gifts to Bethel have extended far beyond the financial. February 07, 2019 | 1 p.m.
First, it was the Coffee Club. Then, it was the purchase of a few chairs in Benson Great Hall. A few years later, it was a gift to help build Ona Orth Athletic Complex. Over the last four decades, Pam ’72 and Paul Olson have utilized almost every method of charitable giving available—and their gifts to Bethel have extended far beyond the financial. Now a member of the Board of Trustees, Pam helps shape Bethel policy, provides guidance on strategic issues, and collaborates with university leaders to ensure that Bethel’s evangelical heritage is sustained into the future. She follows in the footsteps of her father, who donated his time to Bethel in retirement as executive assistant to the dean of Bethel Seminary. Upon his death, the Olsons created the Gordon D. Nymann Memorial Scholarship for mid-career seminary students. At 50 years old, he retired from his career as a corporate executive, stepped off Bethel’s Board of Trustees—where he served from 1996 to 2001—and accepted an advising role in Brushaber’s administration. Hardly a year later, he became the senior vice president of university advancement and asked to forgo the salary that came with the position. When Brushaber refused the request, the Olsons decided to use a portion of his compensation to fund a deferred charitable gift annuity. Their deferred gift annuity and other planned gifts—including a charitable lead trust and charitable remainder unitrust—have furthered that goal, but they’ve also made short-term gifts to Royal athletics, the Bethel University Foundation, the annual fund, capital campaigns, and special projects. 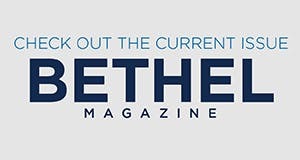 During Paul’s seven-year tenure as vice president of university advancement and strategic advisor to Brushaber, he helped Bethel transition from a college to a university, expanded the Bethel University Foundation, oversaw the $100 million Next Step Comprehensive Capital Campaign, and helped launch what is now a thriving MBA program. But perhaps the most impactful experience for the Olsons was the in-home Bible study they held with senior business students on Tuesday nights, which fostered intimate fellowship and long-held friendships. Learn more about planned giving at Bethel. Our planned giving officers are experts in helping donors maximize their security in retirement while simultaneously advancing Bethel's mission to prepare and equip the next generation of Christ-followers.